We’ve all heard, and experienced, winning and losing. 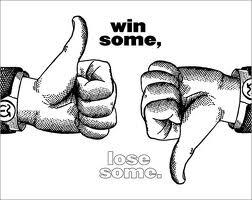 Is winning everything or is being a “good” loser equally important? Some of us take it better than others and move on while others, not so much. And many of us have been to local sports events, rooting for our kid’s team and witnessing “bad” losers both on the field or court and in the stands. Is there some value to winning and does losing impact us in a negative way? That’s why we were intrigued by this article, The Psychology of Winning–and Losing” from CBSnews.com published last week. “Winning’s probably the single most important thing in shaping people’s lives,” Ian Robertson of Trinity College, Dublin said to CBS news. “All species have hierarchies. And your position in that hierarchy will determine your health, your mental function, your mood.” The reason winning is such fun is largely chemical, Robertson states, because winning increases testosterone that then increases dopamine which in turn makes us feel better. That’s why you never hear anymore about the losers of the Super Bowl, or any other athletic event. It’s not how we are wired; we crave that winning feeling. So how does that relate to our everyday lives? Ultimately, it’s about setting realistic goals and achieving them. Whether our goal is to lose weight, to be more loving, to get the necessary credentials for a promotion, or whatever is important in our lives, what’s really important is to participate and finish. Of course we all want to be number one in whatever endeavor we undertake. But the key to winning is to have a healthy attitude about losing so that we get back in the game no matter what. What’s your winning strategy?